This keto recipe for meal prep has juicy spice crusted chicken stew paired with low carb golden cauliflower rice. 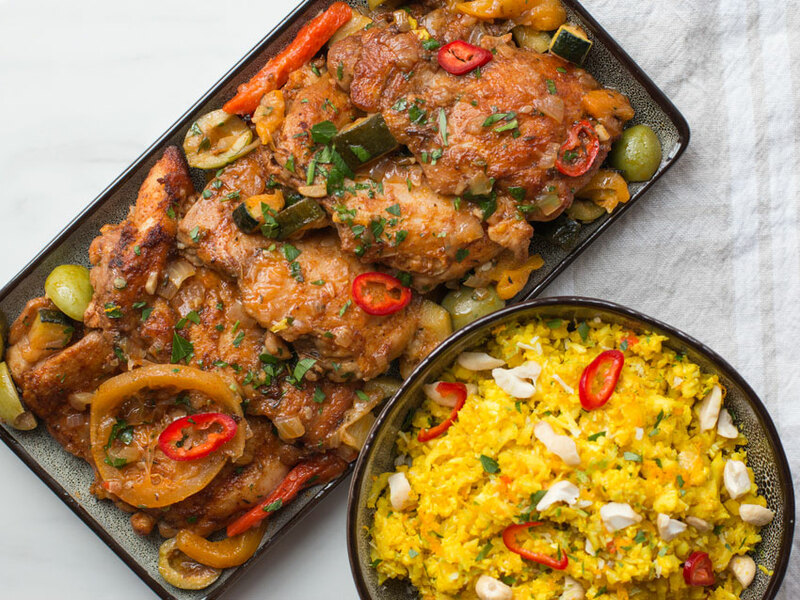 The turmeric and coconut milk from the rice pair perfectly with the Moroccan flavors of the chicken, creating the ultimate meal prep recipe for the week. This recipe is one of the most popular keto diet meal plan videos on the FlavCity YouTube channel. 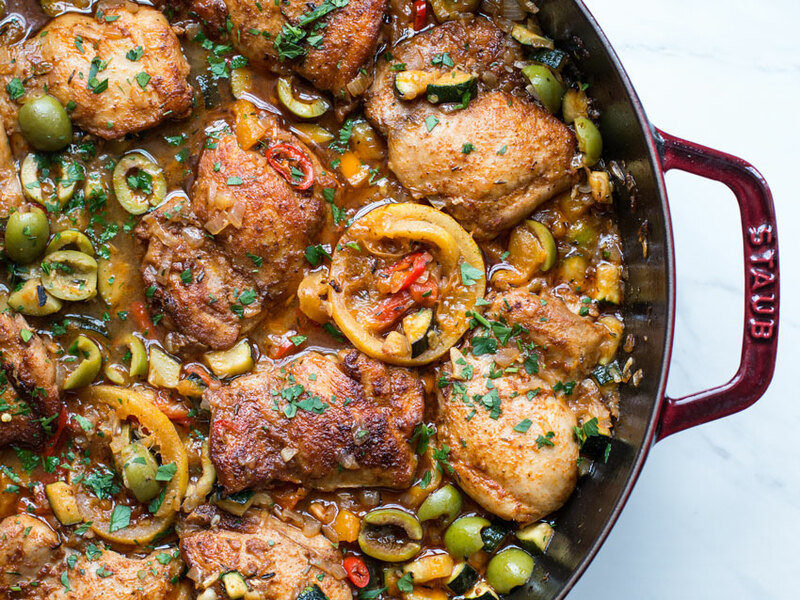 The chicken stew is a one pan wonder that is full of flavor and very easy to make. The key is adding the right spices, searing the chicken, and adding lots of flavorful goodies to the braising liquid. The chicken stew is so tasty, you will be ecstatic that you have 5 servings made for meal prep for the week. 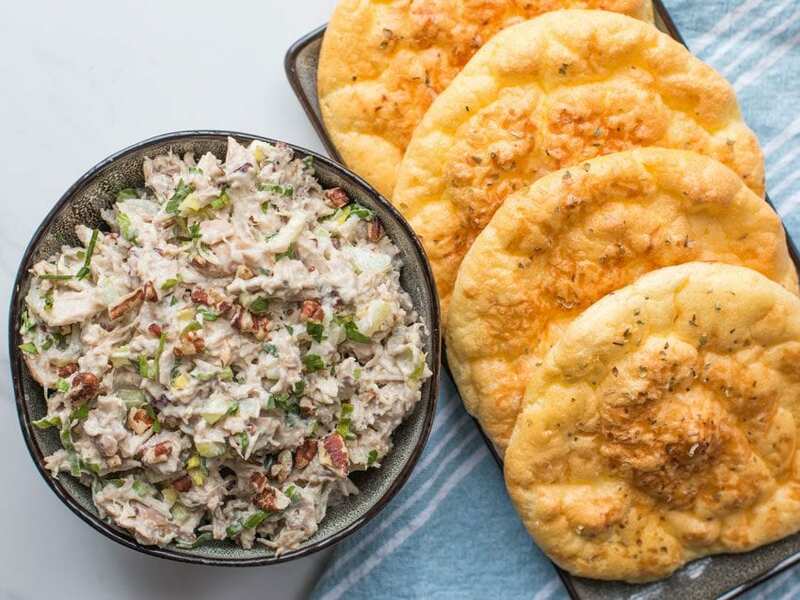 If you want some more easy keto chicken recipes, check out my crispy chicken thigh and slaw meal prep and my epic keto lunch recipe for chicken salad with cloud bread. I wanted to give this keto chicken stew recipe a Moroccan twist, so I added a bit of cinnamon and cloves to the spice rub on the chicken and braised the chicken in lemon slices, green olives, and herbs. The result is a chicken stew meal prep that is monster on flavor and really only takes 45 minutes from start to finish. You will need ten boneless and skinless chicken thighs to make this chicken meal prep recipe that is ideal for dinner. The first step is searing the chicken creating a crust with that yummy spice rub. The chicken thighs make this low carb recipe very keto diet friendly, and they have much more flavor than chicken breasts. 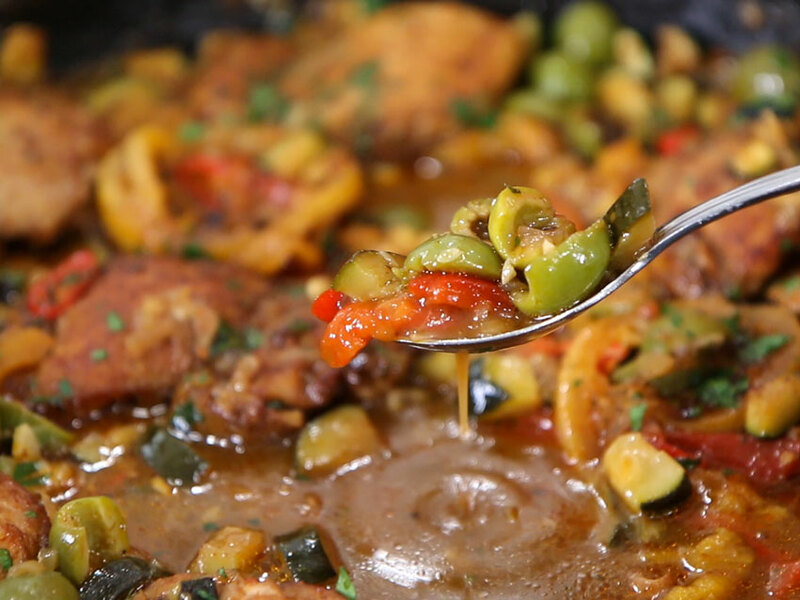 Once you sear the chicken and get the veggies in the pan to saute, all you have left to do is a quick braise back in the pot with some low carb veggies like olives, roasted peppers, and some lemon slices for a Moroccan flavor. This recipe for keto chicken has an absurd amount of flavor. It starts with the spice rub and then the cooking liquid. But make sure you allow the chicken thighs to sit at room temperature with the spice rub on for 20-30 minutes. Otherwise the chicken might cook unevenly. Chicken thighs have a lot more flavor than breasts, and many people don’t realize that they only have a little more fat and calories. While the chicken is braising in the flavorful broth, you can make the low carb golden cauliflower rice to finish off this keto meal plan. 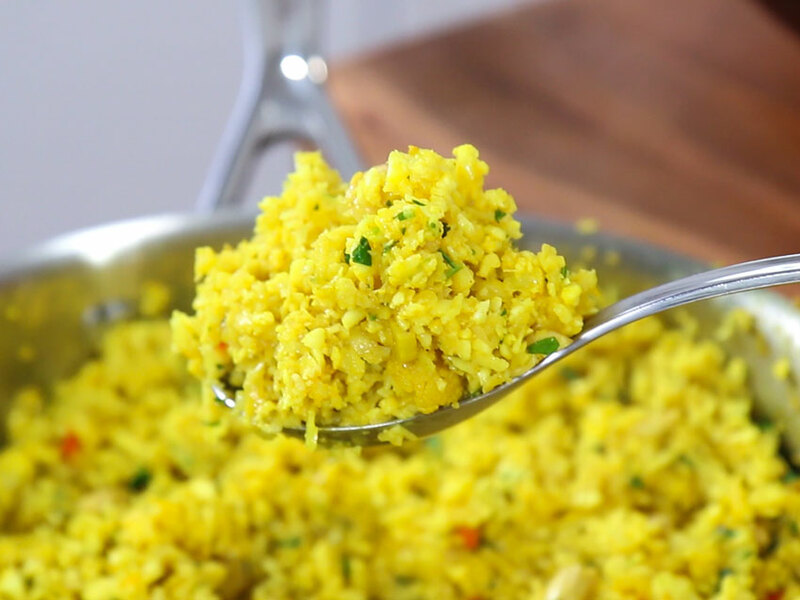 This golden turmeric rice with coconut milk could be the best cauliflower rice recipe I have ever made. I mean, just look at that brilliant color y’all! The key is to cook the turmeric in the hot pan so it blooms the essentials oils before adding the coconut milk. Make sure to use full fat coconut milk and be ready for the color to turn into what I call an edible mandala. It’s so darn beautiful. This meal prep recipe makes 5 servings for the week. Go ahead and store everything in the fridge for 5 days. When time to reheat, the best way is in a 350 degree F oven for 8-10 minutes. If you have to use a microwave, cover the container with a wet paper towel and make sure not to over-heat. Otherwise the food will get dry. You can freeze the chicken for 2-3 months, but the cauliflower rice can not be frozen as it get too mushy. Tasty keto meal prep for the week with juicy and flavorful chicken stew with low carb golden cauliflower. 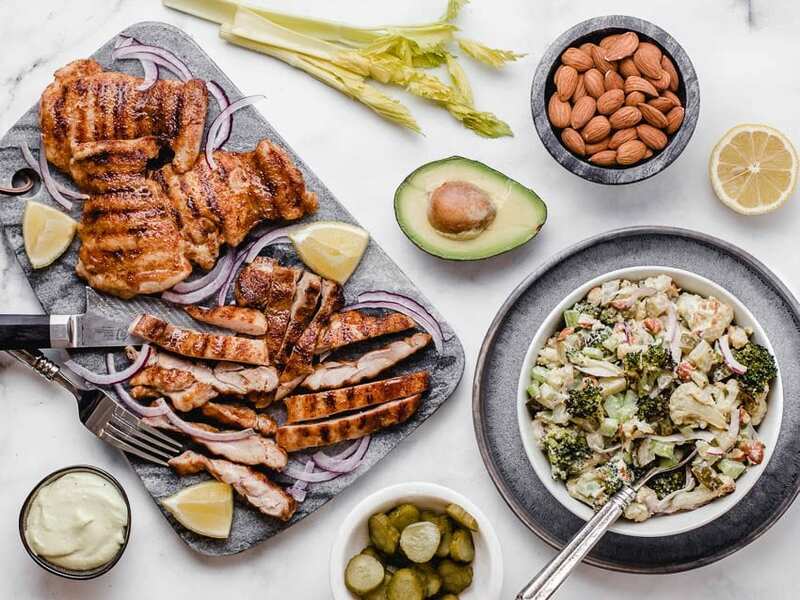 Keto diet meal plan recipes done right. For the chicken, make the spice rub by combining the smoked paprika, cumin, coriander, cinnamon, and cloves in a small bowl, mix well. Season the chicken with a generous pinch of salt and half the spice rub on one side, flip and repeat. Pre-heat a wide pan just over medium-high heat for 2 minutes. Add 1 tablespoon of oil, wait 30 seconds, and add the chicken to the pan. If your pan is not big enough to fit all the chicken, do this is 2 batches. Cook the chicken for 2-3 minutes, or until the crust is golden brown and crusty, flip and repeat, remove from pan. Lower the heat to medium, add 2 teaspoons of oil to the pan and then add the onions, zucchini, thyme, ¼ teaspoon salt and a few cracks of pepper. Cook for 10 minutes, stirring often. Add the garlic and cook for 3 minutes then add the roasted peppers, olives, chicken along with any juices, and enough chicken stock to come half way up the side of the chicken. Tuck the lemon slices around the chicken and add the sliced chiles. Bring the liquid to a boil, reduce to a simmer and cook uncovered for 20-25 minutes, or until the stock has reduced considerably and can be used as a sauce. Move the chicken around the pan a couple times so everything cooks evenly. Sprinkle over parsley when the chicken is ready, set aside. Meanwhile, make the cauliflower rice by cutting each head of cauliflower in half and grating them on the largest setting of a box grater, trying not to grate too much of the stalk. Pre-heat a large pan with high sides over medium heat for 2 minutes. Add 1 tablespoon of oil and then add the onions along with ¼ teaspoon salt and a couple cracks of pepper. Cook for 6 minutes then add the garlic and grated ginger. Cook for 2 minutes then add the turmeric powder and mix well. Cook for 45 seconds then add the coconut milk and mix well. Bring the milk to a simmer and cook for 5 minutes, until it has reduced some. Add all of the cauliflower rice along with ¼ teaspoon salt and a few cracks of pepper, mix very well. Place a lid on the pan and cook for 3 minutes. After 3 minutes check to see if the cauliflower is done to your liking, if not, cook another 2 minutes. Turn the heat off and add the coconut flakes, nuts, lime and orange zest, parsley, and red chiles. Mix well and check for seasoning. You can add lime juice, orange juice, or salt if desired. 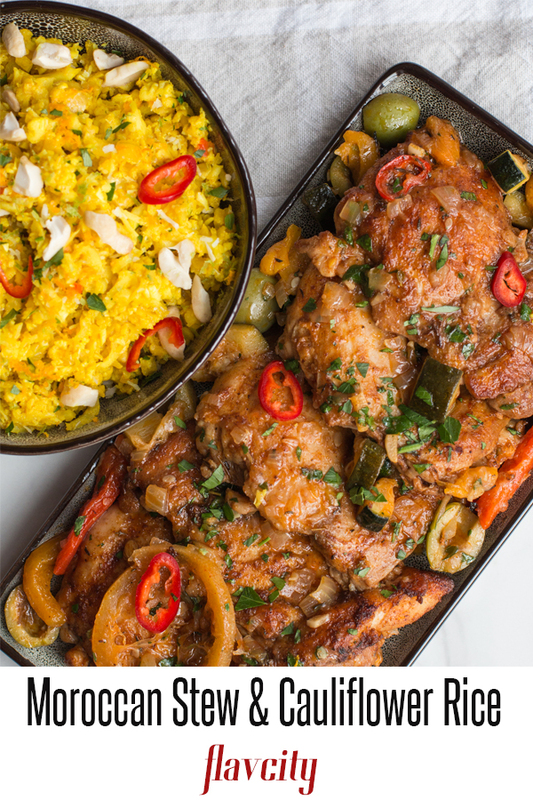 Serve the chicken with some of the turmeric rice and enjoy! Everything can be frozen for 2-3 months or will keep in the fridge 2-3 days(which I prefer). Reheat in a 400 F oven for 10-15 minutes or cover the container with a wet paper towel and heat in a microwave, making sure not to overheat as the chicken will dry out. It’s best to thaw before reheating. 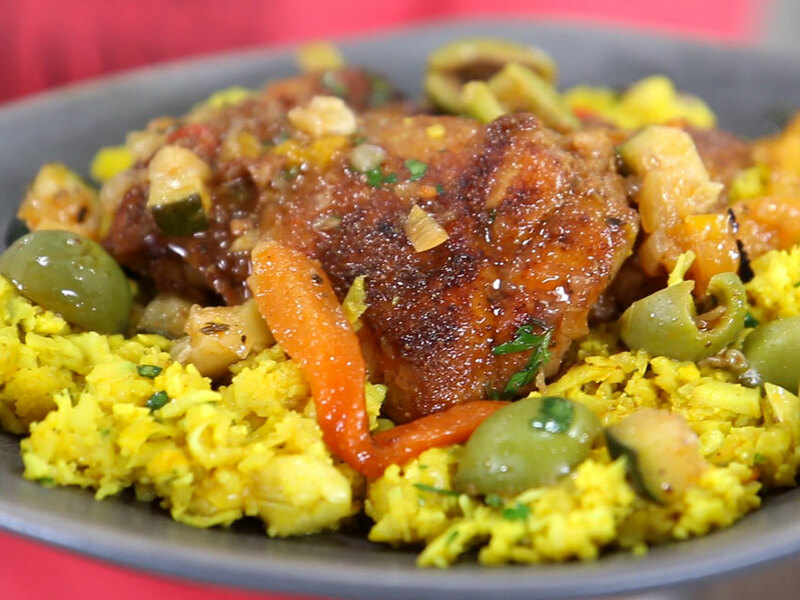 Where can I find the recipe for your Moroccan Chicken dish. The recipe listed here is for a beef dish. I watched the video and it looks amazing but I’d like to print the directions. Thank you!!!!! Works now!!! I cooked alongside the YouTube video and it came out amazing!!!!! I will be making this again. Amazing recipe. I got here via your YouTube channel. 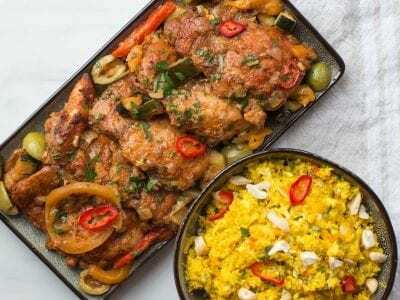 Just wanted to alert you that while the images for this link (https://www.flavcity.com/budget-keto-chicken-meal-prep/) are of the chicken dish, the recipe here is for a beef kefta dish (which also looks great!). Thought you might want to know. Thanks for your great channel and recipes! Just made this for the fam and they loved it! Even my picky eater of a dad, haha. Thanks Bobby! This was delicious and follow friendly. I absolutely love it! I didn’t have much faith in this recipe, lol! Not at first. I was pleasantly proven wrong. Can’t wait to try others. Enjoy! Having a hooked on phonics moment posting this, so short and sweet.. This is a delicious, follow friendly meal. I love it! Love your recipe. Can’t find the seasoning/spices like coriander, smoke paprika ,only found paprika not smoke. Where can I get them? Thanks for sharing .Would love to try. Thanks so much Merian! Whole foods sells in the bulk section or you can order on amazon. I have a spice shop in my area, and I can buy spices by the ounce. Thanks so much Timoya! Not spicy at all, it just uses a lot of spices 😉 Enjoy! Absolutely delicious recipe!!! The flavors are amazing and the tumeric cauli rice felt like you were eating coconut rice, which added a whole new dimension to the dish. I don’t really like the flavor of cauliflower, but i loved the rice. 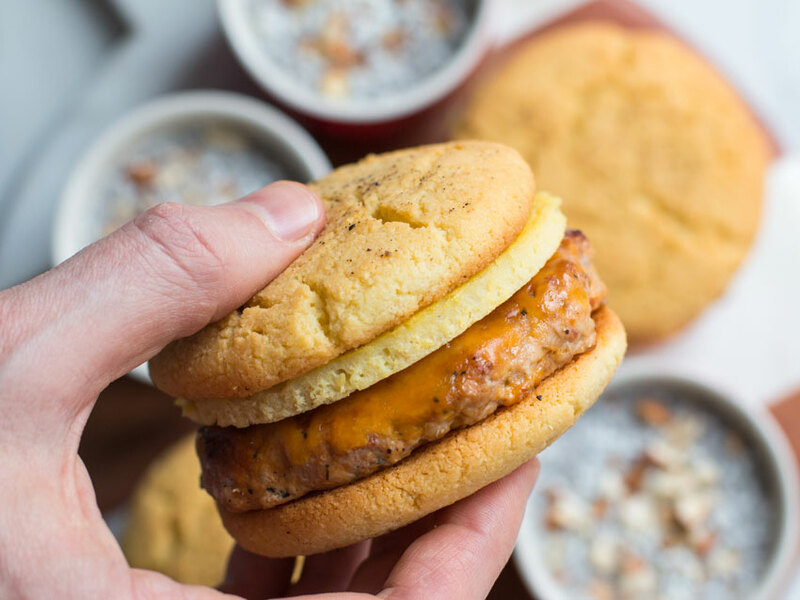 Definitely worth a try if you’re looking for a new keto recipe. I calculate macros based upon overall weight, so just take the total volume of chicken and cauli rice, and divide by 5! 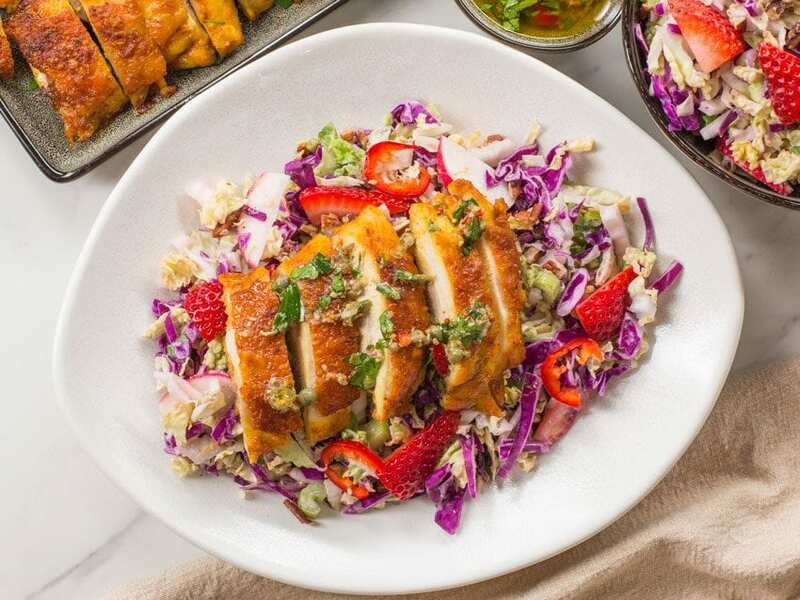 This dish looks really delicious and healthy! I will try it tomorrow for sure. Btw, what is the brand of pan did you use? The one that looks copper. I am looking for a reliable pan that is exactly the size that you used. I hope to hear from you. Thank you so much! 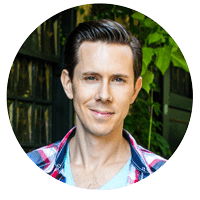 OMG… I was thinking about starting the keto diet and then I came across Bobby’s recipes on youtube. After seeing his recipes I knew I had to try one of them so my mom and I made this recipe, and when I say this was delicious it was sooooo delicious. Now because of this recipe and the others that Bobby has available I believe without a doubt that I can start the keto lifestyle and stick to it. Thank you to Bobby and his wife for starting this channel and doing these recipes because now I have hope for the future and my weight loss journey. Thank you to everyone who made this possible from the bottom of my heart… I really feel like this will help me make a change. Wow..this is fantastic tatiana!! I want t use this comment as a testimonial its so lovely 😉 You can defo stick to keto, its easy when you have tasty recipes that dont make you miss carbs. Keep us updated and thanks for the love!! You sure can use my comment as a testimonial…. and I will definitely keep you updated. I plan to make sure that i achieve my goals this time especially with these awesome meals and the keto lifestyle in general. This dish looks amazing!! I want to try this but my husband hates olives, would it take away too much of the dish if we left them out? Also, would extra virgin olive oil work instead of avocado oil? Thanks! You can defo leave out the olives and use evoo, will be great! How to you manage to keep your pan shining? I am never able to get it this shiny. Is it just elbow grease or is there a trick to it? THE CAST IRON?? i clean it after every use with hot water and a sponge…and every 3-5 times I rub a little oil in there and cook over med. heat for 5 minutes. Yes, its a pain but I love my cast iron! Hubs and I just finished devouring this. Oh. My. Word. Bomb recipe! Definitely going into our monthly rotation. So glad we found you guys on YouTube! I’m stuffed from eating, yet still can’t wait for leftovers tomorrow night. Score for FlavCity…win for us! I would give it more stars if I could! This is the first recipe i’ve made for your website. And oh boy, it was a party of flavor in my mouth. Brought it to work for lunch today and warmed it up, let me tell you everyone in the office wanted a piece of it 🙂 they couldnt believe it was cauliflower rice (made it myself hihi 🙂 ). Thank you for this amazing recipe, it’s delicous and full of flavor. So glad to hear it, Harmonie!!! Thank you! I have to say, I was very skeptical of this recipe at first but it turned out to be absolutely amazing. I made this in my super small kitchen of my college apartment, so I cut the recipe in half and it still took me 2 hours but it was so worth it! The last time I bought cauliflower rice, I bought it already grated and I hated it. Grating the cauliflower myself did require a arm strength but I can definitely taste this difference in doing it myself. Also, the coconut milk did the cauliflower rice so much justice. Lastly, the zucchini came out sooo soft- ugh I’m in love with this entire meal. I’m saving this recipe forever- I can’t wait to try your other recipes! Thank you for making healthy food not taste so bland!! Lesley, you can use cow’s milk or unsweetened almond milk! I just stumbled onto your youtube videos a couple days ago. I am a bit of a food snob and really love the amount of flavor you pack into your recipes. I have done keto on and off for about a year, but I am planning to do it for the long haul and finding your recipes has inspired me. I am planning to make this one tonight. Just a note because it may mess up some people….could you please fix the nutrition label you have on this recipe? It looks like you have net carbs in the total carb section of the label and hopefully most people would catch that, but in the chance they don’t … how amazing would it be if this dish was actually less than 3 net carbs !!! Hi Heidi, glad to hear it! And good catch, I’ve updated the label! Wow, this was so yummy! I could do without the olives, but maybe I needed better quality ones? One thing I would do differently is to make sure everything is measured and shredded and cut and cubed before I start cooking it next time. You make it all look so easy on YouTube :p. I must have given away my box shredder, so I just kept chopping that cauliflower and man, you were right about the taste difference (vs store bought cauliflower rice)! I think next time I will do the same recipe with just cauliflower florets, less work, equal yum! I love your Youtube channel! One of the best recipes I’ve ever cooked!! Thank you, Bobby!! The spices on the chicken are to die for and the cauliflower rice could fool anyone into thinking they are eating rice! Thank you Katheryn, it’s one of my favorite recipes! I just made this for dinner. Absolutely delicious! I am new to your YouTube channel and I’m obsessed. Love your flavor profiles. Glad I found you! So happy to hear it, Maria!!! Keep on Cooking! This is my first recipe and it was amazing. I modified it slightly and it still came out with amazing flavor and texture. That’s great to hear. Keep on cookin’! I can not wait to make this. It looks out of this world. This might be a stupid question but I’m new to meal prep. Most weight out the portions. Do I need to weigh it out or just eyeball it ? Weighing out portions is optimal, but if you divide evenly to your eye you should probably be fine. This is an amazing twist of tastes in one meal. This was delicious but I am not a fan of coconut milk, a little too sweet for me. Is there a different ingredient that I could use instead (i.e. whole milk)? I’m still looking for a tasty rice but I am not focused on the Keto part. I’ve never liked cauliflower but I really love the texture and that fact that it is healthy!! I’m hoping I can flavor slightly less sweet. Thanks for making cooking so easy and tasty!! If you don’t mind it not being keto, milk is probably fine – though you may need to add some cream too. Thank you! Great to hear that you enjoyed the recipe!